If you govern over a body of water, you want crystal clear water. 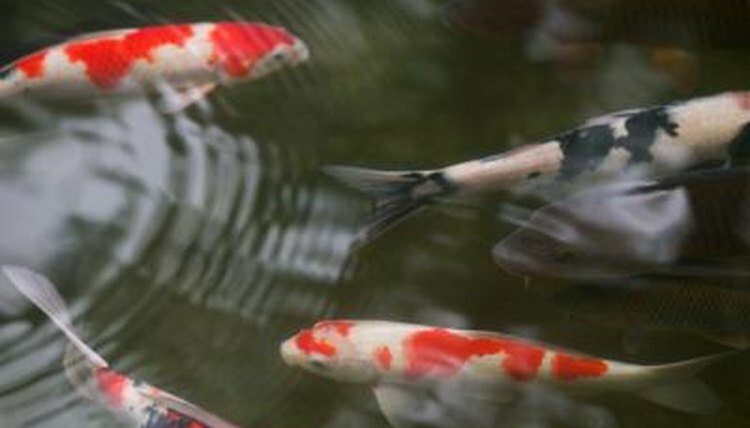 Keeping a koi pond is a popular hobby with a built-in challenge: Koi make water dirty. They're eye-catching, though, with bright colors and smooth swimming strokes. The point of a koi pond is to enjoy the fish in their natural habitat, so keeping the water see-through is the name of your game. Every pond take on its own dynamic -- each is unique to some degree. Diagnosing the reason for cloudy pond water is frustrating even for the most seasoned pond owners. Pond water can become cloudy for a variety of reasons, but the most common is a planktonic algae bloom. The water need not be green to suspect algae, especially if you use algae treatment. Once the live algae are treated, the plantlike organism dies. Dead algae will turn a pond cloudy with a gray, mucky look. To clear up cloudy pond water of this sort becomes a matter of filtration. Cleaning your filter cartridge, or media, daily can speed up the recovery process. Koi are animated fish who show such exuberance at feeding time; it's easy to lose track of how much food you've put into the water as they gobble it up. Excess food in the pond water will make it cloudy. This can be because the food has broken down to create an organic mush or because excessive food dye has leached out and tarnished the water clarity. Too much food means more fish excrement and more rotting uneaten food, which commonly cloud water. Cut back on the food, and the problem will lessen. The rule among aquarists is to feed these fish as much as they can eat in three minutes. New pond owners are sometimes in such a hurry to outfit their watery ecosystems that they don't take the necessary time to scrutinize any additions going into the pond. Purchase rocks and plants for ponds from a reputable pond dealer -- the rocks used in ponds are often the source for gray cloudy pond water. Thoroughly clean and soak them prior to going into the water. Some rocks emit particles into the water in the form of sludge, talc, internal seepage and sediments. Soaking for a couple of days will help define the rocks' characteristics. For pond plants, they grow and decompose, and their emissions can turn the pond cloudy. Clearing out old plants, cutting back root systems and ensuring proper filtration will assuage that issue. The best way to treat cloudy pond water is to prevent its culprits. Proper filtration is essential. Do not skimp here: Get the exact filter for the amount of water, with the indicated turnover per hour ratio. Some pond owners, to speed up the clearing process and eliminate fine particulates, will put a sheet of quilt batting around where the the filter intake, checking and rinsing the batting daily. Regular algae treatments will ward off algae. Eliminating direct sunlight on the pond will help. A filter system with UV-C lighting is a comprehensive algae eliminator.